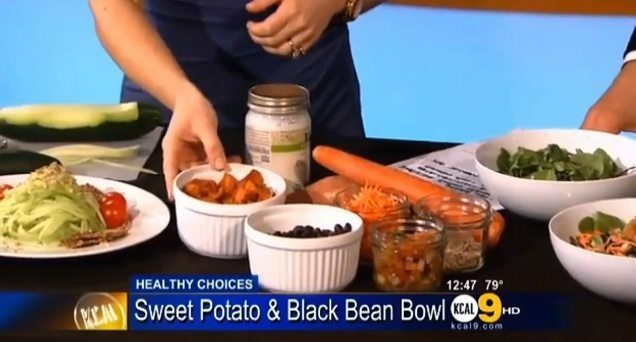 This Healthy Grocery Girl recipe, Sweet Potato Black Bean Bowl, was featured in my “Healthy Meals You Can Make At Home” segment on CBS KCAL9. You can make this recipe easily at home too! It’s affordable, delicious, and satisfying! Preheat the oven to 425 degrees Fahrenheit. Next, wash and chop sweet potato into small cubes. Evenly spread sweet spuds on a baking sheet and coat with coconut oil. Bake sweet potatoes for 15-20 minutes or until sweet spuds are evenly cooked, and then transfer sweet potatoes into a small bowl. Meanwhile, open, drain and rinse black beans from the can and transfer into a small bowl. Next, wash spinach, and place into small bowl. Wash and shred carrot, and place into a small bowl. By placing each ingredient into separate bowls this allows each person to customize their own meal! To create the “Sweet Potato Black Bean Bowl” , add the following ingredients together into a bowl to serve one person, 2 cups spinach, ½ cup sweet potato, ½ cup black beans, a small handful of shredded carrots, sprinkle with sunflower seeds and add a dollop of salsa. You can also add avocado or a splash of salad dressing to this recipe if you desire. Enjoy!